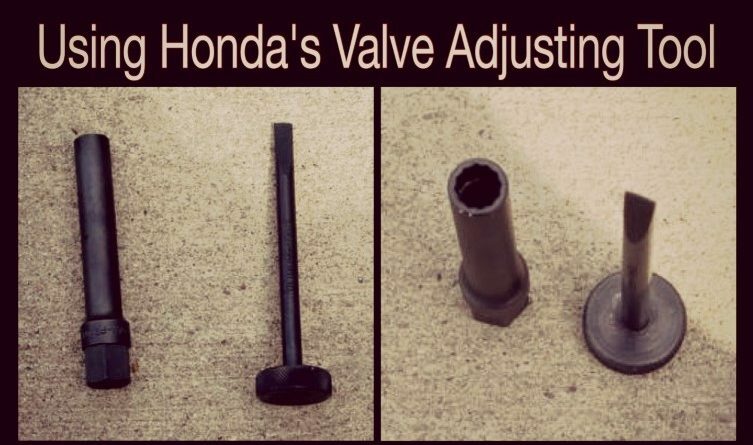 In my special tools section, I included a factory Honda tool that is used for adjusting valve lash. 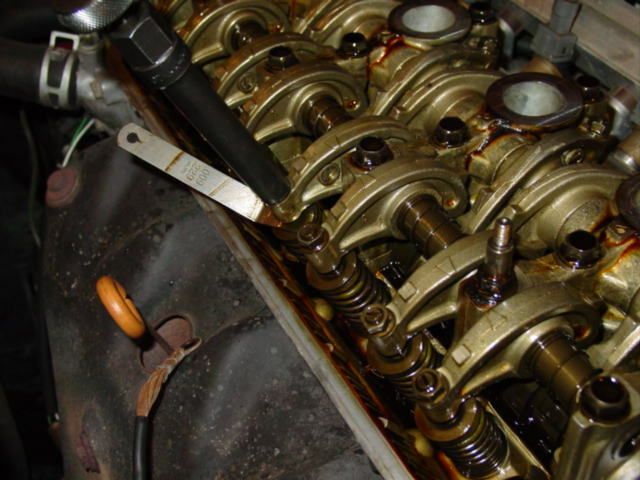 In this page, I’ll describe the use of the tool as well as go over the proper procedure for adjusting the valve lash. Start by turning the front wheels to the left. This will give you adequate clearance to reach the main crank bolt. 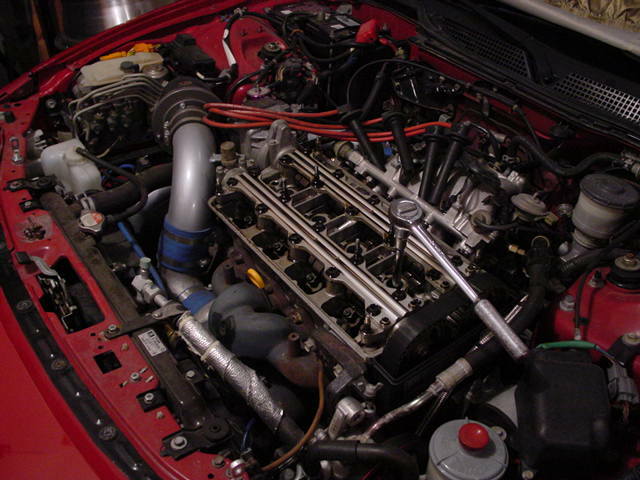 Remove the spark plug cover (B-block, H-block VTEC’s) Pull the spark plug wires and lay them aside. 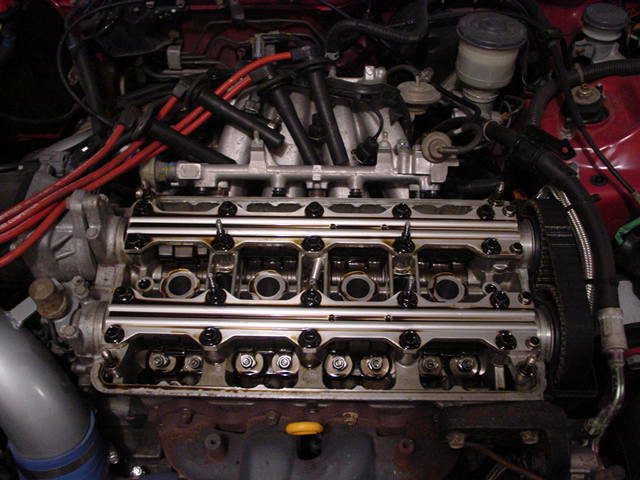 Remove the Breather tube from the valve cover. It’s the hose that attaches the intake tube. 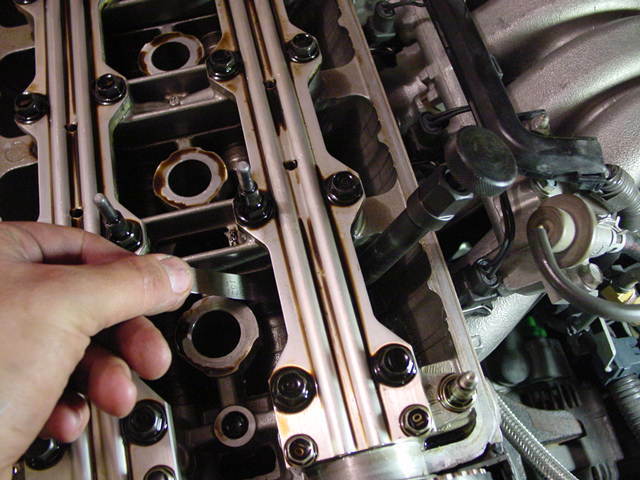 Remove all of the bolts on the valve cover and gently pry the cover. If you use a screwdriver, avoid scratching the surface of the head. One step I like to include, is to remove the spark plugs. It makes it easier to rotate the crank while you adjust the valves. Once you have the plugs out, rotate the crank using a socket wrench and a 19mm socket. Start by setting the crank at Top Dead Center. It should be a white mark and or a notch on the crank pulley. You are ready to do cylinder 1’s valves (cylinder opposite the distributor, or the cylinder the socket is poking out of in the previous picture). 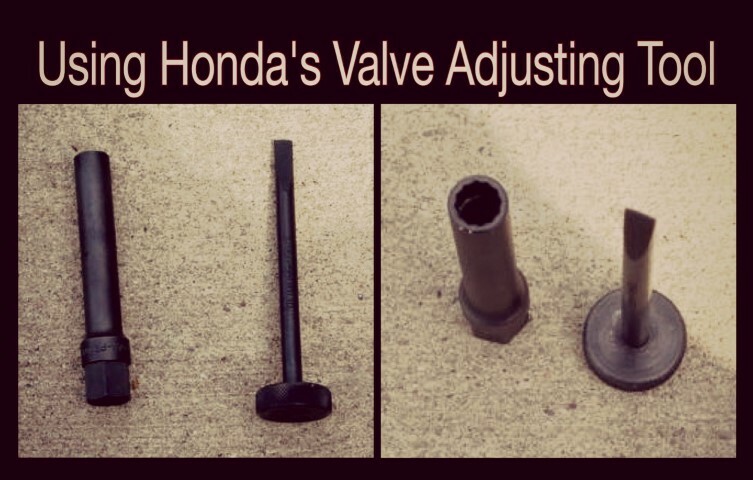 Take the valve adjusting tool larger part and slip it onto the valve lash bolt. At this time, you can slide the “screwdriver” part of the tool in the larger part. 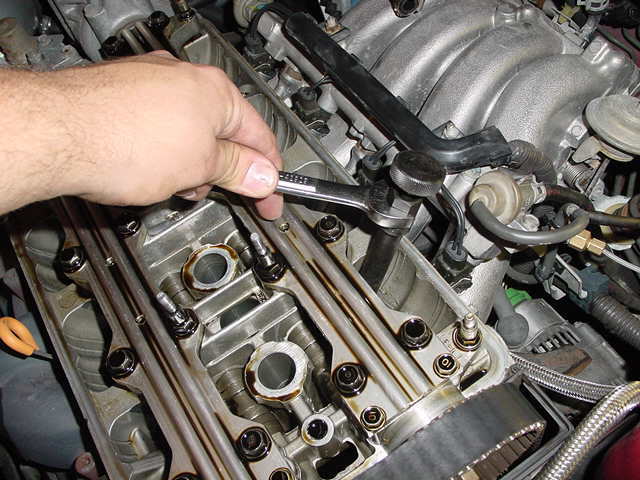 Use the 17mm box wrench to loosen the bolt. Once the bolt is loose, slide the feeler gauge in-between the rocker arm and cam lobe. Once the feeler gauge is in place, turn the tool until the lash gently pinches the feeler gauge. It should be snug, but if it’s stuck it’s too tight. Once you get the lash set, tighten the valve lash bolt with the outer part of the tool while keeping the inner part of the tool from moving (it’s not as tricky as it may seem). Check the lash one more time and move on to the next valve. When you have completed all of the cylinders replace the valve cover. 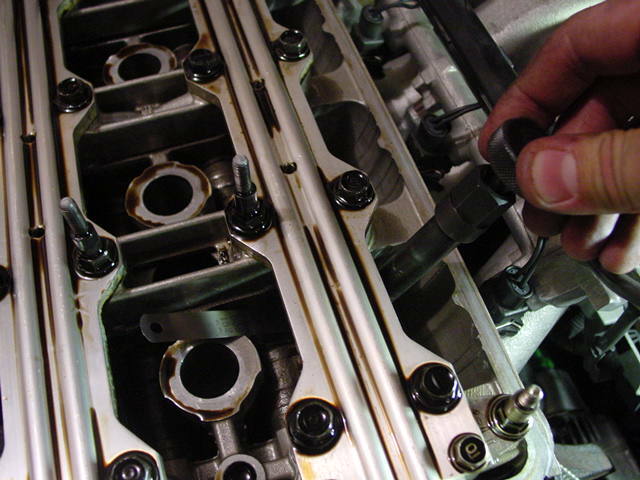 Remember to put some high temp sealant on the corners of the valve cover gasket where they go around the cam caps. Replace the plug wires and plug wire cap. In this case, you can see that all of the components that are used to adjust valve lash are exposed and easily accessible. It would be easy to use a box wrench and screwdriver along with the feeler gauges.